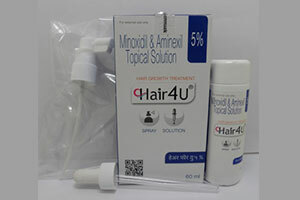 Hair 4U 5% Spray is a combination of two hair growth promoters: Minoxidil and Aminexil. Minoxidil is a vasodilator, meaning it widens the blood vessels and provides better blood flow to the hair follicles. This prevents hair loss and stimulates re-growth resulting in longer, thicker and increased numbers of hair. Aminexil suppresses an enzyme which causes buildup of a protein (collagen) around the hair follicles leading to hair loss. Use this medicine in the dose and duration as advised by your doctor. Check the label for directions before use.